This winter, instead of telling the kids to go outside and build a snowman or grab their gear for sledding, why not provide them with some new ideas? She also likes to make “Sugar on Snow,” a classic New England winter dessert. Kids can easily make it with an adult’s help and supervision. Simply boil maple syrup, pour it into a pitcher, then drizzle it over packed snow. Use a fork or spoon to scoop it up after it cools off a bit and you have a sweet treat. It’s also fun to decorate your yard or fort with colored ice and snow. Deegear likes to put a few drops of food coloring in water, pour it into a balloon, tie it off, and then let it freeze. Once it’s frozen, peel off the balloon and the result is a colorful globe. You can make colored ice cubes in trays, too, perfect for adorning a snow castle. Both AMC experts agree that games traditionally played in warm weather take on a novel aspect in winter. Everything from bowling to golf can be adapted. “Puttbee” is like playing miniature golf, but with a Frisbee. Create the course by sinking sticks into the snow every few feet. Mark a starting place, then take a Frisbee and toss it at the first stick. When you hit the stick with the Frisbee, move up to stand beside the stick, and so on. Decide on house rules about how many times you can throw and how you add up points if keeping score. Another option is to submerge cans in the snow to use as holes, with hockey sticks as clubs and hockey pucks as balls. For bowling, roll snowballs to use as the bowling balls and frozen water bottles (made in advance and stored in your freezer) as the pins. With a little thought, your kids can probably come up with all sorts of activities not normally played in winter. Sounds like a challenge most kids would relish! 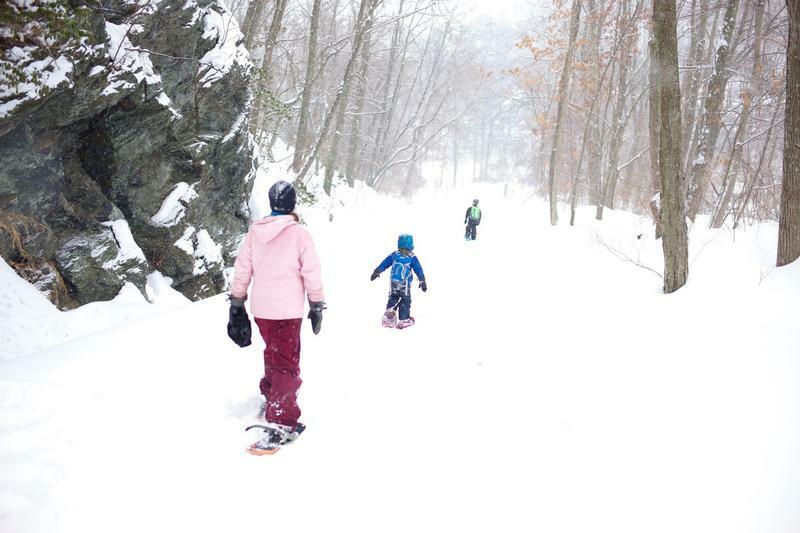 Yemaya St. Clair offers advice on how to stay comfortable when playing outdoors in winter and ways to have a successful winter adventure. START CLOSE TO HOME Hometown adventures feel safe to kids, and it’s always comforting to know that a warm bath isn’t far. When kids experience many winter successes in short duration, they’ll be more enthusiastic about venturing farther for longer. STAY WELL FED AND HYDRATED Winter adventuring requires lots of calories. A body’s warmth is fueled by food, so enjoy a high-energy meal before heading outside and pack plenty of snacks. Consider bringing a Thermos filled with soup or hot chocolate. And remember, it’s important to drink plenty of water to stay hydrated. KEEP MOVING Once you’ve had time to rest and refuel, it’s important to keep moving in order to stay warm. If one child needs longer to rest and finish eating while another complains of getting cold while sitting around, encourage the latter to get up and dance around with you, do jumping jacks, or play tag. Whether you head out or stay in, don't let bad weather put a damper on family fun. Here are some winter precautions you can take to safely enjoy winter with your children.